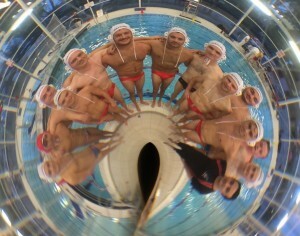 The Watford Men’s team are now ready for this season’s BWPL which starts this weekend in Sheffield. The season runs until February and is split into two Phases in the first phase Watford will start in Division Three & play seven matches against team from Birmingham, Exeter, Hucknell, Southampton, Otter, York & University of Bristol. On Saturday evening the team play Exeter & then entertain York on Sunday morning. Then in early October the team will travel to Lancaster to play a further three matches (Otter, Bristol & Hucknell) before ending Phase One at Watford on the 31st Oct & 1st Nov when they will play Birmingham & Southampton. Watford Men’s team with Coach Edi Brkovic @ Basildon Pool – September 2014.. If Watford want to gain promotion this season to Division Two for the 2016 campaign they will need to finish in the top five of Div three & if they do that they will progress into “Championship Two” for Phase Two of the season were the top five teams from Div Three & the bottom three from Div Two will play each other once over three weekends in December, January & February. Following these seven matches in “Championship Three” if Watford finish in the top three they will gain promotion to Division Two for 2016. Have you got that!!! Karan Basu (GK), Danny Davis, Andy Holt, Richard Hime, Paul Skerm, Gianluca Valle, Jack Pickford, Sam Carling, James Warman, Cami Baker, Nandi Cseh, Luke Rogers, Dan Kattan, Peter Pickford. This entry was posted in announcements by Steve Chambers. Bookmark the permalink. Good luck to Edi and the team. Chelmsford will be rooting for you.